What is a blue line? In the comic book industry they are often equated to cells in animation. Before the digital era of comic book art, blue lines were used to color comic art. The inked art would be printed on a piece of bristol or illustration board in a blue called, non-repro blue because it does not reproduce when copied. The inked art would also be printed on an acetate overlay, which was used to allow the colorist to see how their finished art would look with the ink lines over their color work. 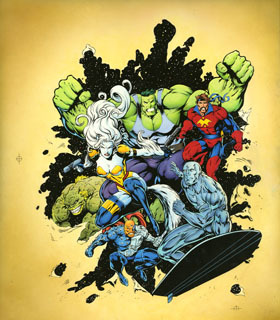 This image is from the 1996 Marvel Team-Up Calendar. Blueline color with acetate overlay.